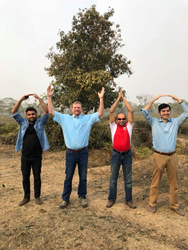 Buyers from Columbus coffee roaster Crimson Cup Coffee and Tea recently visited an organic tea farm in Bangladesh to develop a sustainable new source of regular and herbal teas. Transparent, mutually beneficial relationships are the hallmark of the Crimson Cup mission. Buyers from Columbus coffee roaster Crimson Cup Coffee & Tea recently visited Kazi & Kazi Tea Estate Ltd. in Bangladesh to explore a sustainable new source of teas. Teas and herbs grown on the plantation hold Fair Trade, Rainforest Alliance and USDA Organic certifications. Ubert and 7 Steps Trainer Steve Bayless were accompanied on the trip by Senior Director Zia Ahmed and Assistant Director Rahul Ponappa of the Ohio State University, Office of Student Life, University Dining Services. Crimson Cup teas and coffee are served on the university’s campus. The visitors were impressed by the quality and productivity of the estate, which was created on barren, previously uncultivated land in 2000. The natural, organic farming methods it uses include Neem based bio-pesticide and cow dung based fertilizers.